If you are here from Pinterest (or anywhere really! ), welcome! I’m truly grateful to all of you who have pinned or shared this post in any way. I sincerely hope it is helpful to you! I love feedback and participation. Many of you have fantastic ideas! Leave comments so we can all learn from you too! 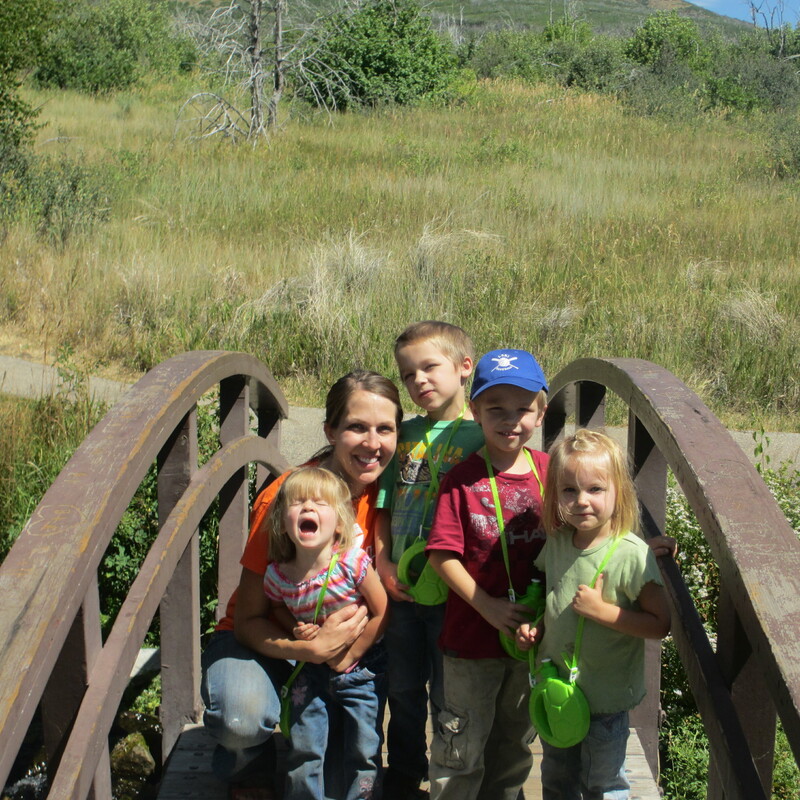 Having four kids in three years completely changed my ideas about camping. My husband and I used to love it and go often with no need for a camping checklist! We’d just throw everything in the car and take off. Our needs were minimal, and we could improvise as needed. But with kids, camping suddenly became a very overwhelming idea. Kids have so many more needs! We would need a lot more supplies, and I didn’t even know where to start! The Problem with Family Camping: No Camping List! Just thinking of everything I needed for a one-night camping trip with kids was overwhelming, not to mention actually gathering it all each time! Didn’t someone have a family camping list of everything I’d need? I found a few ideas, but nothing comprehensive enough for me! As you know, I like to be prepared. 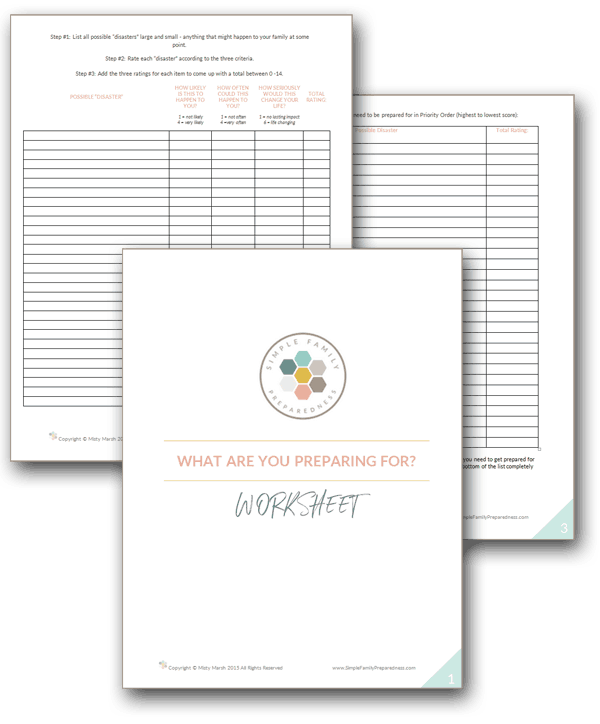 Being prepared and organized takes a bit of work up front, but it pays off in a whole lot less stress in the end! Camping is something I am determined to do with my kids. It is fun! I loved it as a child! It is important to have fun as a family. Plus, I believe it brings us closer to each other as we work together and to God as we appreciate His creations. Those are things I’m determined to provide for my family. 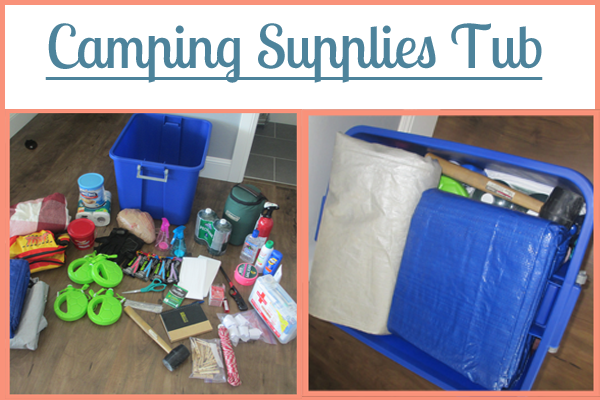 I decided to get prepared when it came to camping with kids! Many have asked what tubs I used. I just picked some up at Walmart that I thought would work well. They are 20 gallons 22 3/4″ x 16 1/4″ x 16 1/4″Sterilite tubs (and they are typically cheaper at Walmart than through that link). One thing I like is that they have handles that “snap” into place. They are large enough to hold everything, but three still fit in the back of our van. However, after just 2 1/2 years, they are starting to wear/crack. A few readers have suggested (more expensive) “storage locker” tubs such as this one since they have molded grooves for sturdy stacking and are more durable/long-lasting. I’ve been told they are strong enough to double as seating. I will likely switch in the near future. 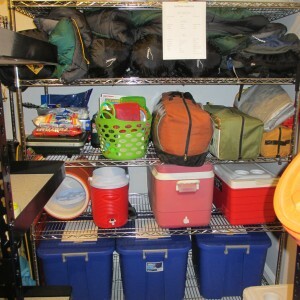 Each tub’s list is split into two sections: (1) A checklist for camping supplies that need to be checked/washed/refilled after each camping trip, and (2) A checklist for camping supplies that stay in that tub permanently unless they get broken, etc. One important part of these tubs is the idea that the supplies stay there. For example, I have scissors that I use every day. But I also have a separate set of scissors that stay in our camping tub. I don’t have to find and pack scissors each time I want to go camping. Yes, this takes a bit of an initial financial investment, but it actually wasn’t much. I got most everything at the dollar store! 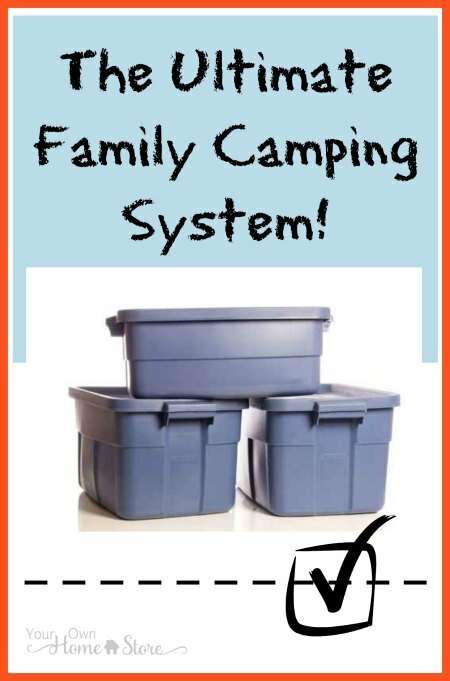 These camping packing lists have made our family camping trips nearly stress free! Okay, maybe there are still a FEW stressful moments! The only thing I plan each time is the food we will eat. 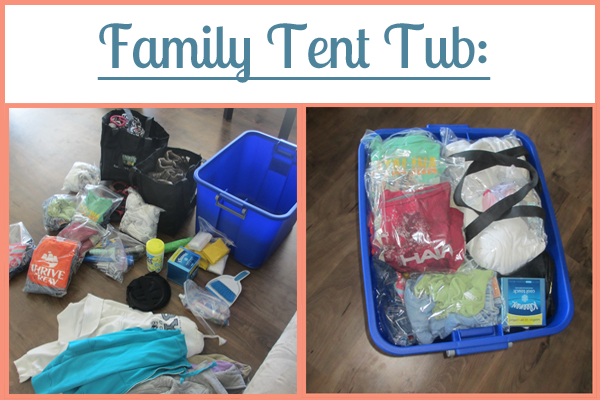 Once we are ready to go on a family camping trip, we grab our tubs, the stuff on our “last minute” camping list and we are out the door in less than 30 minutes! At camp, everything has its place in a tub, and we always know just where to find everything when we need it because we have a laminated version of each list on each tub. Since I’ve spent the time to create these camping lists, you won’t have to do it at all! They are all ready to be printed and put on tubs of your own! However, since every family is different, if you prefer, you can download them as a Word document. Then you can edit them to fit your family better. Add a few things, delete others, etc. Okay, on to the lists you can download! Plastic and Styrofoam Cups: We always have hot chocolate when camping and the styrofoam works better for this, but they are bulkier. We like the plastic cups better for everything else! 2016 Update: I still use paper plates (just easier with kids than washing all day…and we burn them), but I’ve switched cups to save on space/reduce waste. We now use these collapsible cups. I love that everyone has their own, they have lids (no bugs if you leave your cup out for a while), and they are easy to pack. 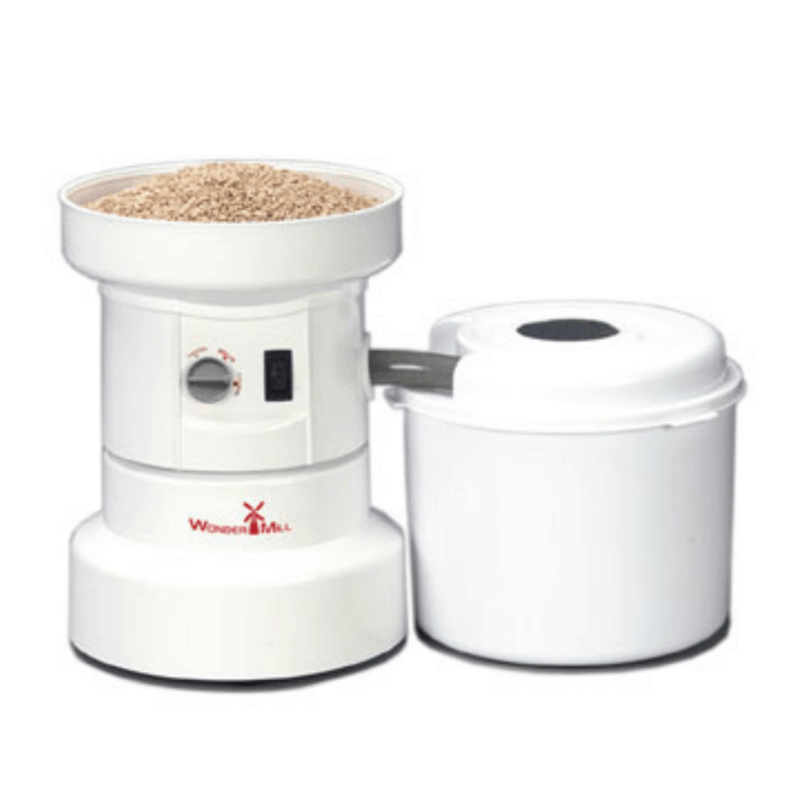 They can also be used for hot AND cold drinks! Sharpie: For writing names on plastic cups so you only have to use one per person! 2016 Update: With our new cups, we no longer use this. Bar Soap & Nylons: Put the soap in the nylons and tie the nylons to your water source. Easy hand washing station! I got these at the dollar store. 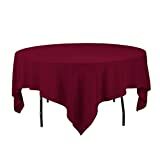 Clips for Table Cloth: Nothing is more annoying than a tablecloth that won’t stay put because of wind! I originally got some HUGE clips at the dollar store to attach it firmly to the table. 2016 Update: I’ve actually started using these fitted plastic tablecloths and I LOVE them. The clips worked, but occasionally got in the way or got knocked off or didn’t fit a table at a certain camp spot. I’ve loved the fitted covers! Just make sure you get the 8ft long ones, not the 6 ft ones. Most camping picnic tables are 8 ft long, and a bit too long is better than a bit too short! Also, don’t expect them to last past a camping trip or two. They are pretty thin. 2017 Update: I had many readers suggest using an old twin sheet. I haven’t tried it yet because it’d be hard to wipe down/keep clean during each trip, but it’d be cheaper. Maybe you could bring one for each day? Wash Tubs: I used to use a couple of large Tupperware type tubs (you can see them in the picture above, but I’ve switched to these foldable sinks (take less space). Toothbrushes/facewash/shampoo/headband, etc. : We use all this where our water is, which is usually near the “camp kitchen.” So, this stuff works better in the kitchen tub than the family tent tub. Download the Camp Kitchen Camping List! 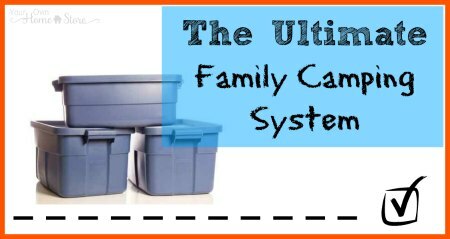 This camping list includes everything you’d need inside your family tent. Clothes, flashlights (after our dollar store lights went out after just one or two uses, we use small high powered ones now and LOVE them), pajamas, contact solution, etc. 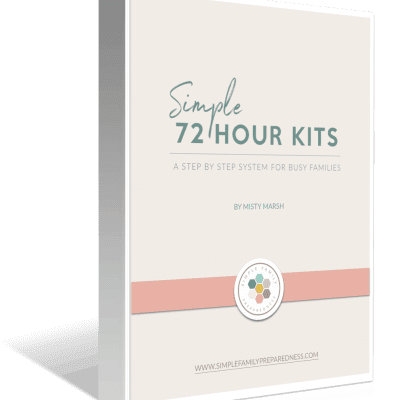 Let me know if there is something not on the list that you’ve found to be essential in your family tent! Flashlights: We keep a lantern outside our tent. That is plenty of light for us to get from the campfire to our tent, so we only keep one flashlight in our “supplies tub” just in case. But once in our tent, the lantern is off and if someone needs a potty break, they will also need a flashlight. 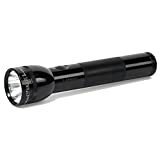 Each child has their own small flashlight, and my husband and I have maglights. Clothes: I keep just one change of clothes for every family member in this tub. 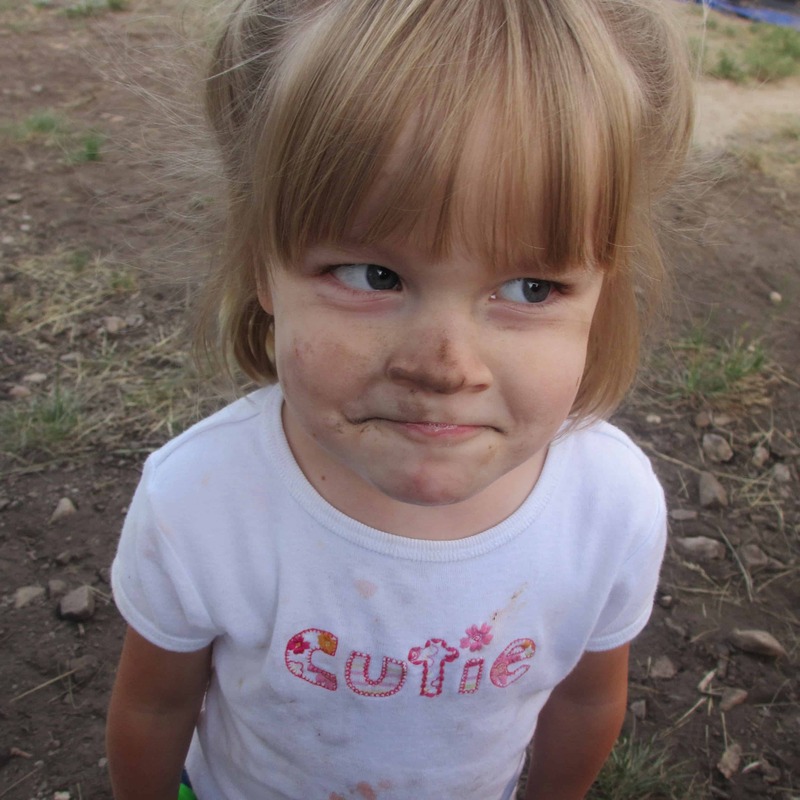 I really don’t care how dirty my kid’s clothes get on camping trips, so that is enough for one-three nights (two-four days). Seems even if I change their clothes, they are dirty in about five minutes anyway! So, they wear a t-shirt and shorts there and use that for the first day or two, and then I keep a t-shirt and an old (just barely outgrown) pair of shorts for each kid to change into after a day or two. I also have one pair of pants per kid in case it is cold at night. Socks/Underwear: I have three-four changes of socks and underwear for each person. We change our socks and underwear each time we go to bed (keeps you warmer when you have fresh socks. See this awesome infographic for more info on staying warm). Jackets: Once winter is over, I just throw each kid’s jacket into this tub. Even if they are a bit small, they work for camping! Pajamas: I keep one set of PJs for each kid. They change into them right before getting in their sleeping bag and change out of them before leaving the tent for dinner, so they tend to stay relatively clean. Again, I use winter jammies that they have just barely grown out of and are no longer using at home during the spring/summer/fall. Pop-up Laundry Basket & large garbage bag: This is very small/compact, but it makes keeping track of dirty clothes (especially on a longer trip) SO easy! I put the garbage bag inside the basket to make it easy to remove the clothes and pack the basket when we are done! Mini-Broom: Bringing a full-size broom is a pain, and you always have to re-clean your tent when you get home anyway. While we are camping, we just take a small dustpan/broom to help us keep our tent area relatively tidy. I got this at the dollar store. Door Mat: This does wonders for helping to keep the tent area clean! Pump: After forgetting it a few times, I finally added our air mattress pump to the list! I like this one because it uses batteries and doesn’t have to be charged. We used to have a rechargeable one, and I would forget to charge it before we’d go. 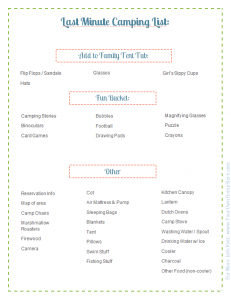 Download the Camp Family Tent Camping List! This camping list includes everything you’d need outside your camp kitchen and tent. Tarps, first aid supplies, lanterns, toilet paper, etc. 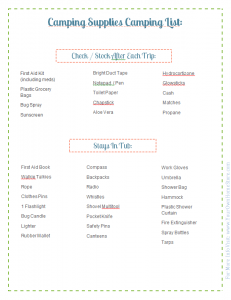 Let me know if there is something not on the list that you’ve found to be essential in your additional camping supplies! First Aid Kit: With so many little ones, mine is pretty extensive. I also include meds for adults and children here. 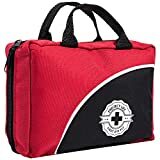 Update: I’ve since taken this first aid kit out of our tub because I created a more complete kit that just stays in our car all the time. 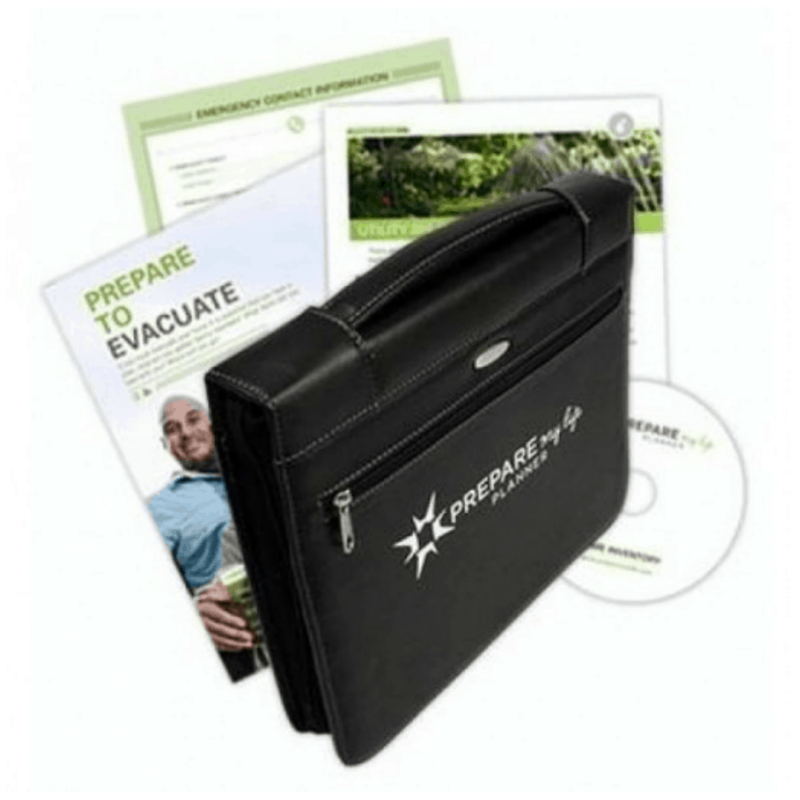 You can find details on that kit here (including a printable checklist): A First Aid Kit Checklist. Plastic Grocery Bags: These are great for a lot of things. I’ve used them most often to keep soiled (urine, throw up, other things…) clothing or wet towels separated from everything else. Bright Duct Tape: Duct tape has lots of uses, but making it bright makes it possible to “mark off” areas where your kids can/can’t go. Having something solid, bright and obvious makes it easier for them not to “cross the line.” (You could also use bright rope.) I got mine at the dollar store. Toilet Paper: We keep ours in an old hot chocolate container to keep it clean. You never know when the wonderful “toilet vaults” will be out! Propane: Our camp stove and our lantern both use the same propane. Update: I no longer bring a 2 burner camp stove. I like bringing two of this smaller (easier to pack) butane stove better. I also like that I can use two large pots if I need to–they wouldn’t fit on the propane stove. Clothes Pins & Rope: Like I mentioned, I only bring each kid one change of clothing. Occasionally, I need to wash someone’s clothes. When this happens, I simply wash and hang to dry. This also works for kitchen towels/rags, etc. I got these at the dollar store. Backpacks. We often go hiking while camping. We keep empty backpacks in this tub so we can pack them up with hiking supplies when we need them! Work Gloves: Great for getting tin foil dinners, etc., out of the fire (we also use the tongs in the kitchen tub for this) among other things. I got mine at the dollar store. Shower Bag: We often leave this home actually unless we are going for a pretty long trip! Update: At the recommendation of some readers, I’ve started bringing this every time and hanging it up in the sun as soon as we get there. The water gets warm and we use it for washing dishes/hands, etc. Cheap Plastic Shower Curtain Liners: Using these are a really quick and easy way to cover supplies if it starts raining! I got mine at the dollar store. Spray Bottles: A way to keep cool in the summer heat! I originally just got cheap ones at the dollar store, but then I found these on Amazon and they are amazing. Expensive, but amazing. We don’t have one for everyone, but they are nice to have. 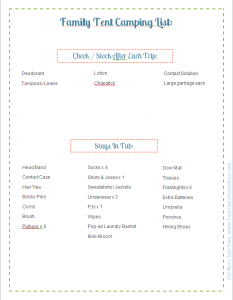 Download the Camp Supplies Camping List! This camping list includes everything we will need while camping that either (1) won’t fit in a tub, or (2) can’t be packed until the last minute. 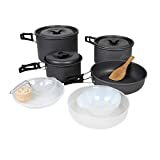 It includes things like sleeping bags, coolers, tent, marshmallow roasters (I like these retractable ones because they are much easier to pack), and our dutch oven, etc. 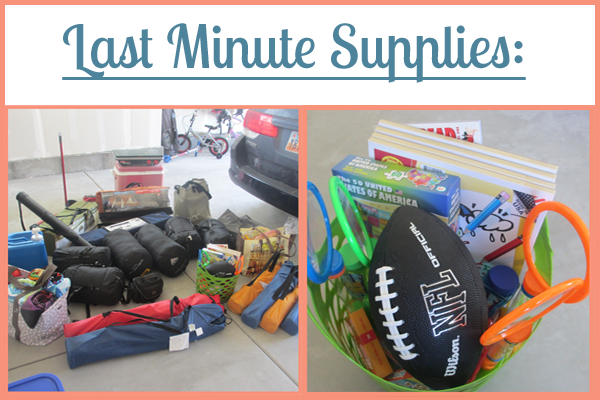 Also on this list is our “Family Camping Fun Basket” with a few things we only get to play with when camping. One favorite in this tub is Mad Libs around the campfire. 2016 Update: I HATED using this basket. The supplies were great, but we moved it to a small tub after the first trip. Update 2017: We have also now added this fun Seek It Camping game. What we actually bring from this list varies depending on where we are going and what we are cooking, if we are going fishing/swimming, etc. 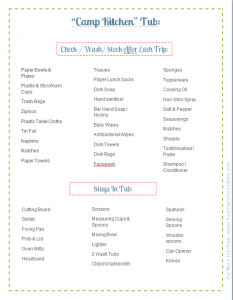 Let me know if there is something not on the list that you’ve found to be essential on a family camping trip! Drink Bag: Update 2016: Since making this list, I’ve also started bringing an insulated bag full of waters/juice. I freeze half of them and put them in the bottom and pull the rest from the fridge cold and put them on top of the frozen ones. The non-frozen ones stay cold for the first two days or so, and by then the frozen ones have started to melt well enough to drink them. Flip Flops/Sandals: We are always camping in the Spring/Summer/Fall, so I can’t leave these in the tubs because my kids are using them, and I’m not willing to purchase a 2nd pair just for camping. We only bring them if we will be near water. Girl’s Sippy Cups: My girls sleep with these. 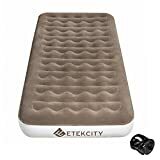 Air Mattresses: These are too big and bulky…but my husband and kids love them. We are trying to find a more workable solution. (-: 2016 Update: At the suggestion of a reader, we switched to inflatable pool mattresses for the kids. 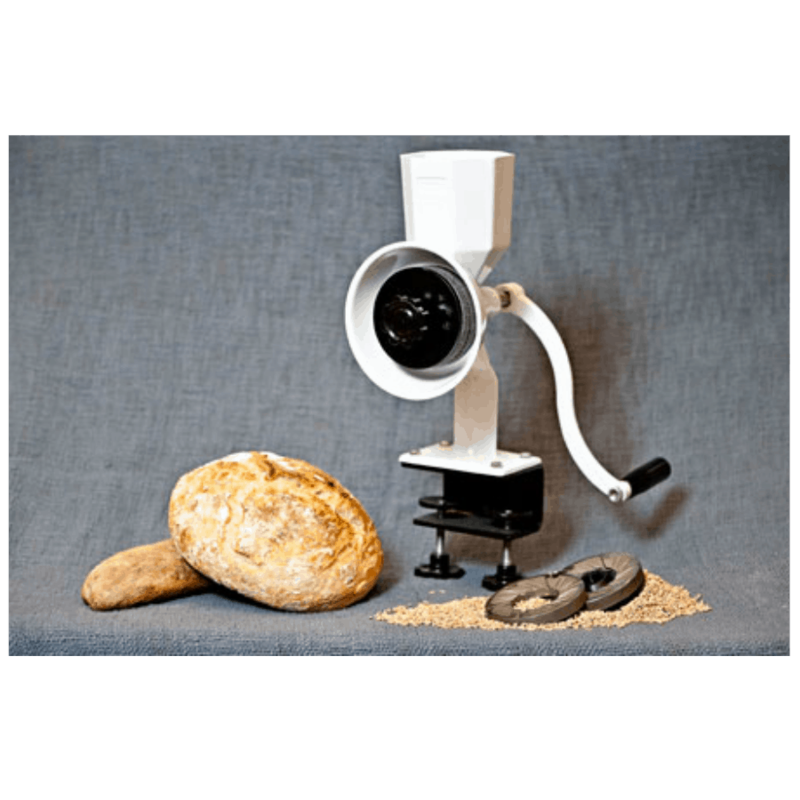 They pack smaller, are cheaper, and work great for the kids. I like this pump because I don’t have to remember to charge it before we leave. Blankets: We always bring a few extras in case someone gets cold. We’ve also had kids get sick all over the inside of a sleeping bag, so we’ve had to switch to blankets. Swim Stuff: We rarely bring this, but if we are going to be able to swim…we throw it in! Fishing Stuff: Again, we only bring this if there is somewhere to fish nearby. Washing Water/Spout: We bring a 5-gallon water container with a spout and attach a nylon with soap in it for a washing station. Update: At the recommendation of readers, we’ve actually started leaving this at home (it is big and bulky) and bringing a Shower Bag instead. We hang it up as soon as we get there. The water gets warm and we use it for washing dishes/hands etc. Lots of you have asked what tent we have. Right now, we have a Glacier’s Edge Pentagon three room dome tent. I don’t like it, and I can’t find it anywhere online to link you to it. It was given to us as a Christmas gift shortly after we had children. The reason I don’t like it is that it is not rectangular (it is a pentagon and there are lots of angles/turns to the walls), so there is a lot of wasted space when you try to lay out cots or air mattresses, etc. But, it works for now. It keeps the rain out and is functional. However, at the first sign of wear/holes, I will be purchasing a different one. I like THIS ONE because it is a rectangle and has straight sidewalls (easier to stand up in…less wasted space). Plus it is HUGE (196 sq feet) which will be nice as the kids get older, but I’m not sure we’d be able to find enough space for it at some campsites as it is a 14 ft square. I’m also interested in this one for the straight sidewalls and rectangle shape. In addition, it has a full height storage locker. Another perk is that the material for the floor comes up the sides of the tent a bit, ensuring better protection against rain. However, it is only 117 sq ft, which we might outgrow with teenagers. What tent do you have? Do you like it? Why or why not? Download the Last Minute Camping List! 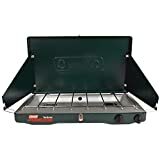 I have had SO MANY requests for a condensed list of my favorite camping products that I finally decided to create one here. I link to many of these products above in the text of the post, but here are my absolute favorites! They all link to Amazon (where I buy almost everything I own). There you have it! 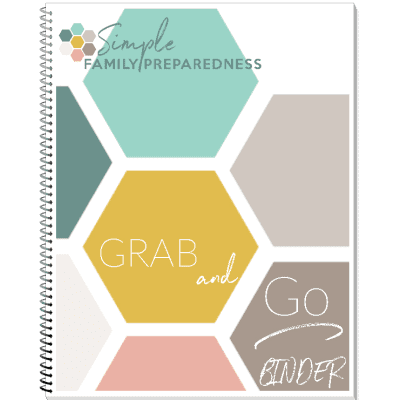 I’d love to know if you print and use these camping lists and if they help your family! Come back and tell us some great family camping stories! Since I wrote this post, I’ve found a few other ways to improve our experience camping with kids. You can find them here: 13 Tips and Tricks for Camping with Kids. You can use the free OpenOffice suite for all of your expensive Microsoft equivalent.